Green State Power offers state-of-the-art, high efficiency commercial solar PV installations at affordable prices. These projects range in size from just a few panels to thousands of panels and can be as large as a roof allows. We take pride in the performance of our systems and strive to provide the most effective system possible in every situation. Solar technology is easily scalable, but regardless of system size Green State Power installs each panel and each inverter with the same amount of attention to detail as the systems on our own homes. 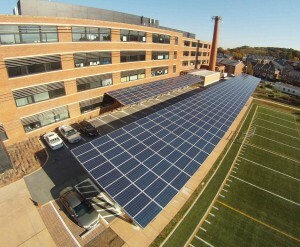 Commercial solar installations can often provide a better return on investment when compared to residential solar systems. Manufacturers are able to provide a better pricing on panels, racking, and inverters as the size of the system increases, allowing for lower cost/watt systems. These factors, along with tax incentives make solar a very attractive investment and one that many business owners are taking advantage of.